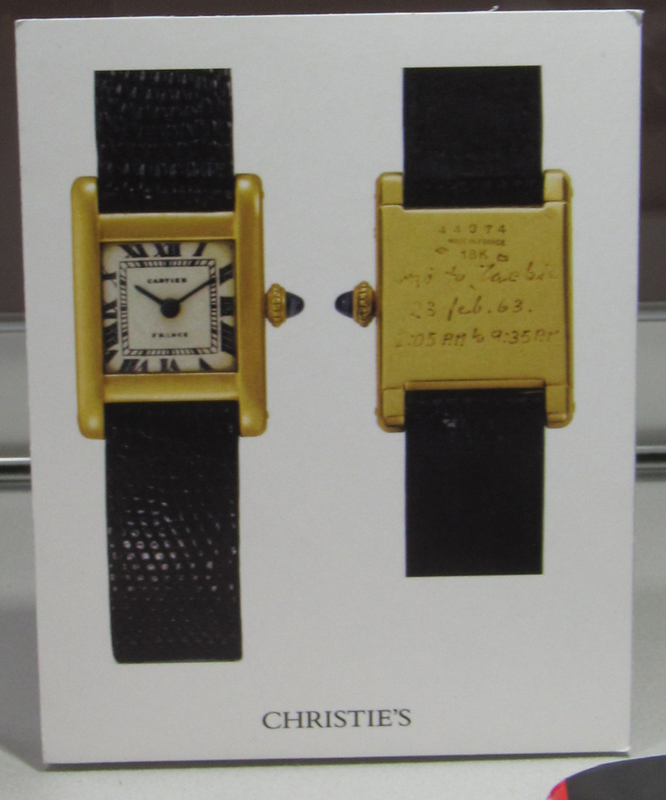 Jackie’s Cartier Tank watch at Christie’s June 2017. It is not every day you get to visit with a piece of jewelry that is not only iconic in and of itself but has been made doubly famous because of who owned it and wore it with such style. 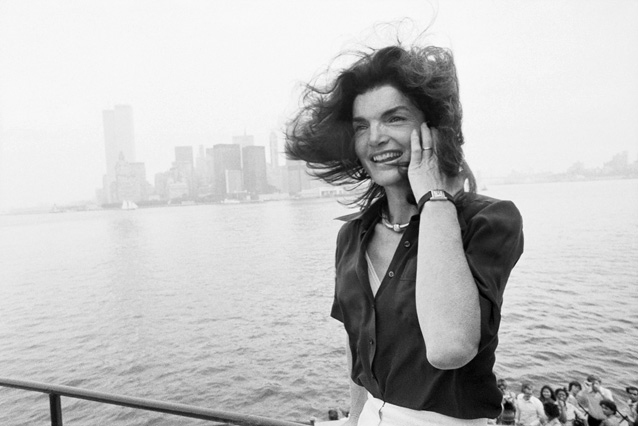 So when I learned that Jackie Kennedy’s Cartier Tank watch was going to auction at Christie’s on June 21 as part of an auction called “Rare Watches and American Icons,” featuring timepieces owned by famous entertainers and a president (LBJ), I had to get to the city to visit with it! 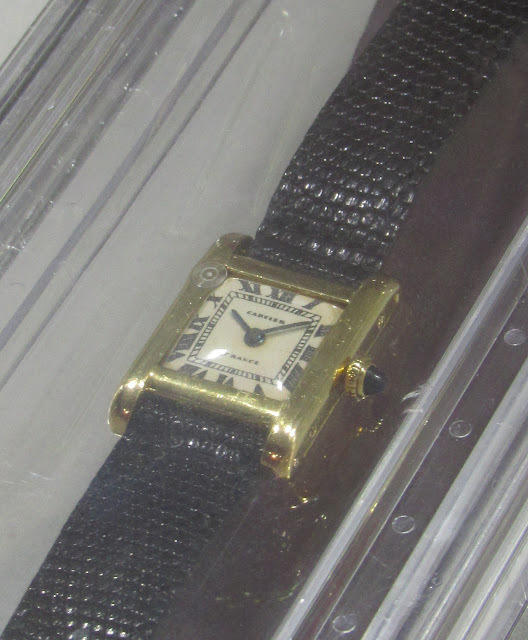 Contrary to what was believed for a long time, this watch was not given to her by her husband, it was a gift in 1963 from her brother-in-law Stanislas “Stas” Radziwill, to commemorate a 50-mile walk he undertook in Palm Beach. There is an interesting article over at The Adventurine that goes into details about the significance of the walk, part of a health initiative started by President Kennedy, who himself was inspired by a directive President Theodore Roosevelt had given to the Marines to take a 50-mile hike in 20 hours. Stas had the back engraved to note the date and his start and end times—he began the walk at 2:05am and completed it at 9:35am—and Jackie thanked him for the watch by painting a small portrait of him during the walk alongside Chuck Spalding, a family friend. The portrait is included in the lot. This small painting Jackie did is included with the watch! This shows the inscription on the back. The watch is in amazing shape and I believe that is a lizard strap attached to the gold case. 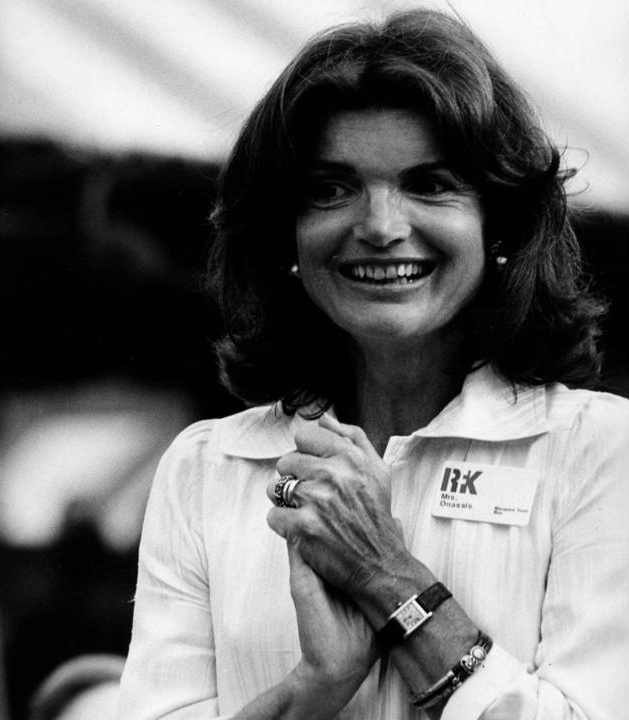 Of course you know this watch since Jackie was photographed wearing it many times. It was wonderful to see it in person and was a great reminder that a well-crafted timepiece can last for decades if it is taken care of properly. The watch is in beautiful condition. An iconic watch owned by an icon! I found these two pictures of Jackie wearing the watch that I had not seen before. Love this photo of windblown Jackie with her Tank and the Twin Towers behind her. Photo by Keystone Pictures USA. Let me know what you think of Jackie’s Tank watch or if you own one yourself (you lucky thing)! Update: The watch sold for $379,500 and the press is reporting that the new owner is Kim Kardashian West. So very sad. A Cartier tank watch has been on top of my daughter's wish list for at least 5 years. It is truly a classic forever piece. Great photos! Wish I could have seen it. Just sent a link about the new owner. I can't even type the name, such a trashy woman and family to own such a piece by Jackie O, a woman of style, strength and class.